Agni informs Kishan that she does not love him and loves Sameer, so she married Sameer. Kishan shatters hearing that and pleads her to tell she loves him. Sameer stops him and warns to dare not touch his wife again. Devi asks Agni if she really married Sameer. Vaishali yells Agni and Sakshi made joke out of marriage. Devi stops her and asks Agni if she married Sameer with her wish. Agni says yes. Kishan shouts this is not true and pours water in havan kund and walks away. Sakshi cries thinking Agni is doing all this for her. Agni tells sameer let us take elders’ blessings. Sameer says he does not have anyone. Agni takes Devi, Sanjay, Vasu’s blessings and then walks to Yashi. Yashi backs off and says she gave all her love to her but not anymore. Vaishali tries to slap Agni, but Sameer warns to back off, tells Agni she wanted everyone’s blessings, let us go now and takes her from there. Once in room, he fumes that he will not let anyone misbehave with her, especially Kishan. Agni holds his collar and warns to be in his limits. 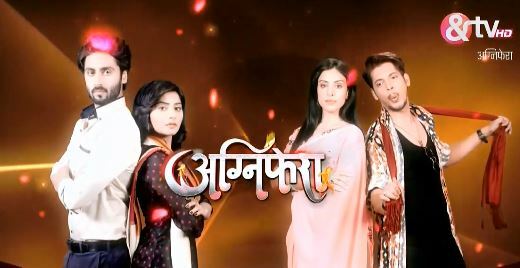 Sameer fumes in anger and says she used him for her benefit and goes into flashback where Agni says she needs his help and wants to act as marrying her. He says he wanted just a coffee date with her, but she fell in his love. She says she can do anything for his help. He gets intimate. She pushes him and says anything except this. Out of flashback, Sameer continues laughing. Sakshi walks out. Sameer asks to come back soon as their suhagraat is pending. Agni walks to Sakshi’s room and sees her crying murmuring why did Agni do this. Sakshi sees her and asks why did she marry Sameer. Agni says as she loves him now and not Kishan. Sakshi slaps her and says she knows she sacrificed Kishan for her, can’t she see Kishan’s pain. Agni asks if only Sakshi can sacrifice, she shows howmuch she loves Kishan and her concern for him. Sakshi says she was wrong, so she backed off. Agni says she realized Sakshi’s love for Kishan and only she can control him. Once she leaves, Sakshi continues crying. Precap: Yashi cries that Kishan is injured, his physical injuries will heal but not mental injuries. Kishan cries asking why did Agni betray him. Agni panics seeing Sameer shirtless in bed. Sameer shuts her mouth saying people will get suspicious about their suhagraat.